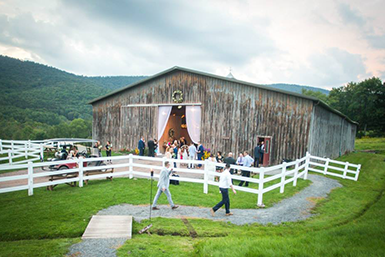 Our beautiful and well-kept grounds feature a temperature-controlled rustic Event Barn, Stone Guest House accommodations, Waterside Pavillion and acres and acres of rolling green hills, horses and farm life. 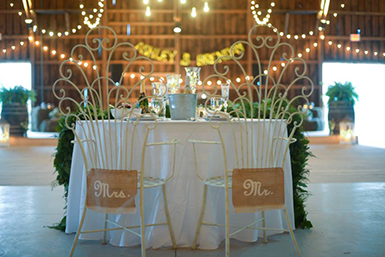 Our 12,000 square foot rustic hemlock restored barn is spacious enough to host 400 guests and comes complete with a bar, raised dance floor, large hale bales and tables and chairs. A cherished piece of Catskills history, the 1803 Stone House is the oldest house in Roxbury, New York and once served as an Inn for travelers coming over the mountain from Bovina. Today, it is a special part of wedding day events, serving as lodging for the wedding party. Our 1,600 square foot pavilion is the perfect spot for sunset cocktails and rehearsal dinner. The beauty and simplicity of nature's finest is the backdrop for our ceremonies - from a gorgeous old maple tree in a secluded wooded sanctuary to on top of a mountain with breathtaking, panoramic views. From Poppy the Goat to our many horses, sheep, dogs and deer that live on property, our Animals are considered extended family here on the Farm. We encourage your guests to enjoy their company and enhance your wedding weekend experience with their presence.